Fountain Freight Road is a former road that is now used solely by bicycles and hikers. The 4 mile long trail connects Fountain Flats Drive to the Fairy Falls Parking area. 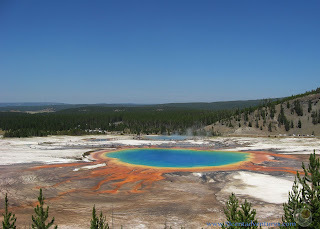 It skirts behind the Fountain Paint Pot area and Grand Prismatic Spring giving a different perspective on these popular areas. Side trails from the main trail lead to impressive sights such as Imperial Geyser, Fairy Falls, and the Grand Prismatic Spring Overlook. Location: The trail starts at the parking lot on Fountain Flats Drive. 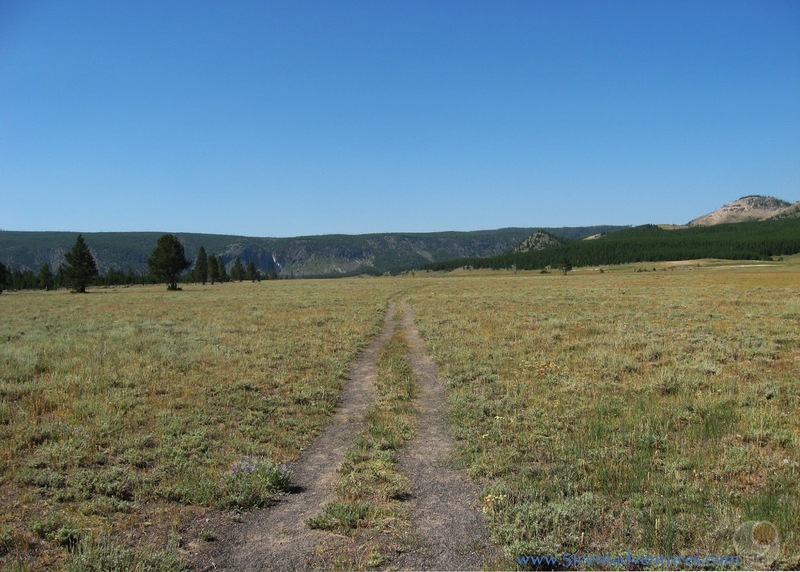 Fountain Flats Drive is roughly 5 miles south of the turn off for Firehole Canyon Road on the western side of the lower loop of the Grand Loop Road. Hiking Distance and Time: Depending on your route this could easily be a 10 mile hike. Plan for it to take all day. In the summer of 2017 I received a job with Xanterra Parks and Resorts in Yellowstone National Park. I moved there with my husband and our four young children. We lived in a 25 foot RV and spent all our free time exploring the park. This is the eighth of many posts that I will write about specific features within Yellowstone National Park. At first these aren't going to be in any particular order, but in a few months I'll start grouping them into lists. This one would probably fit into a list such as hikes to do when you start to feel like you've seen everything in the park. My past three posts have all centered around the Fairy Falls Trail. I hope I've convinced you that hiking on that trail will be worth your time. 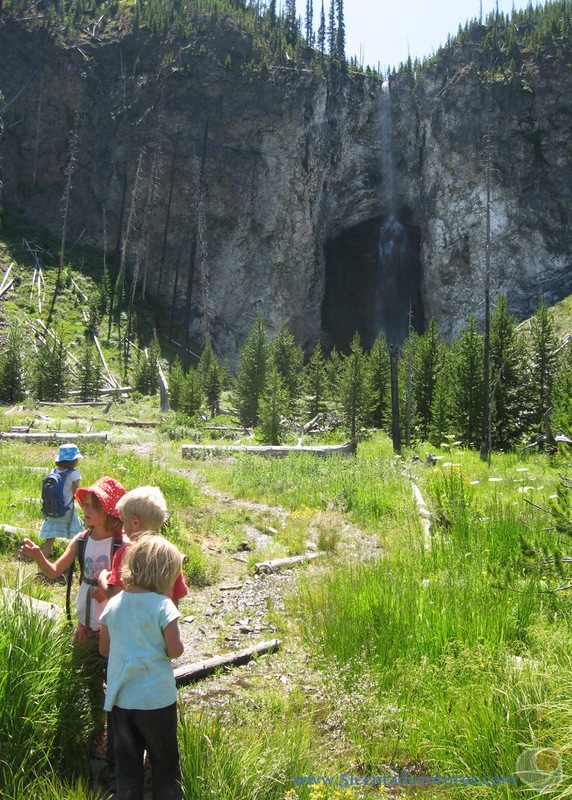 Today I want to take a minute and share with you the route my family took to Fairy Falls because it's one of my favorite memories from our summer of adventure. I want to make one thing clear though. I DO NOT recommend this route for novice hikers, people who don't have a lot of time in the park, or families with small children. 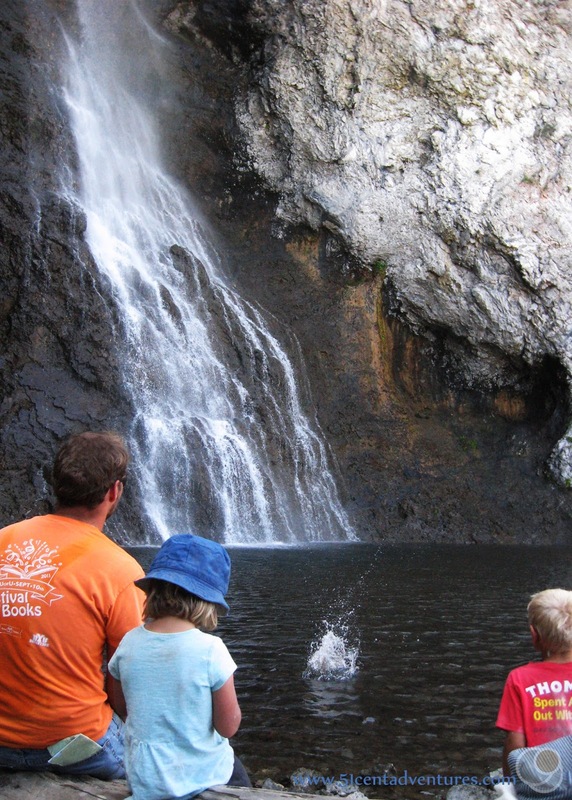 Just because you see my family doing this hike does not mean you should do it. We went on this hike after two months of living in the park. 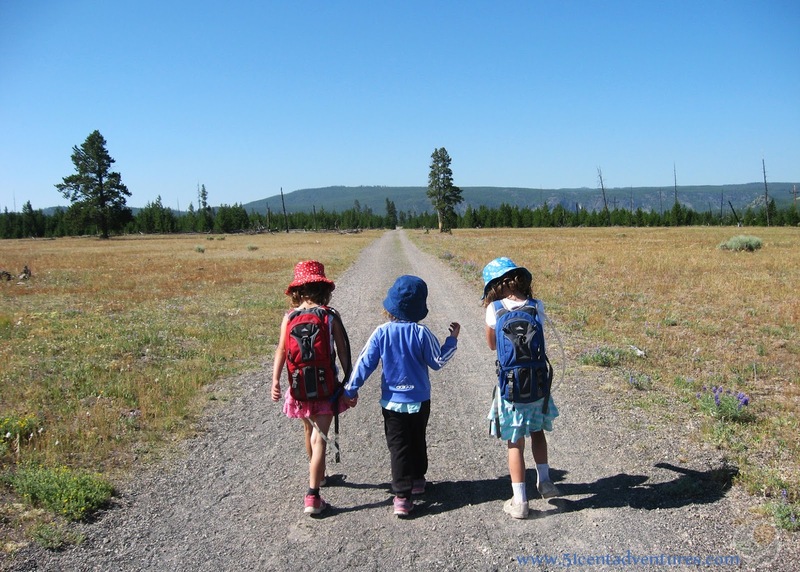 We had the time, and had built up the endurance (physical and emotional) to take young children on a 7 mile/all day hike. If you still think this hike sounds like a good plan, you better get yourself a good guidebook. We used A Rangers Guide to Yellowstone Day Hikes by Roger and Carol Shiverly Anderson. 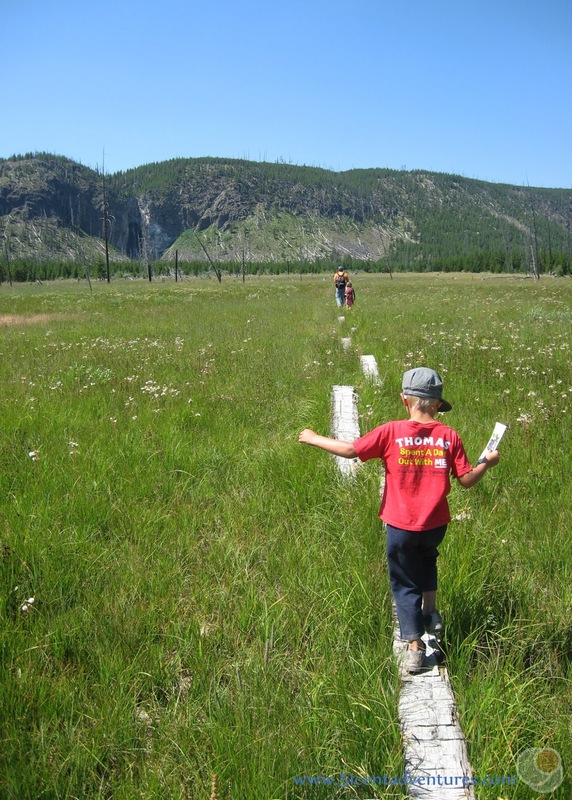 We also carried the Day Hikes of Yellowstone National Park Map Guide by Jake Bramante. Both these books are available at gift shops in the park. 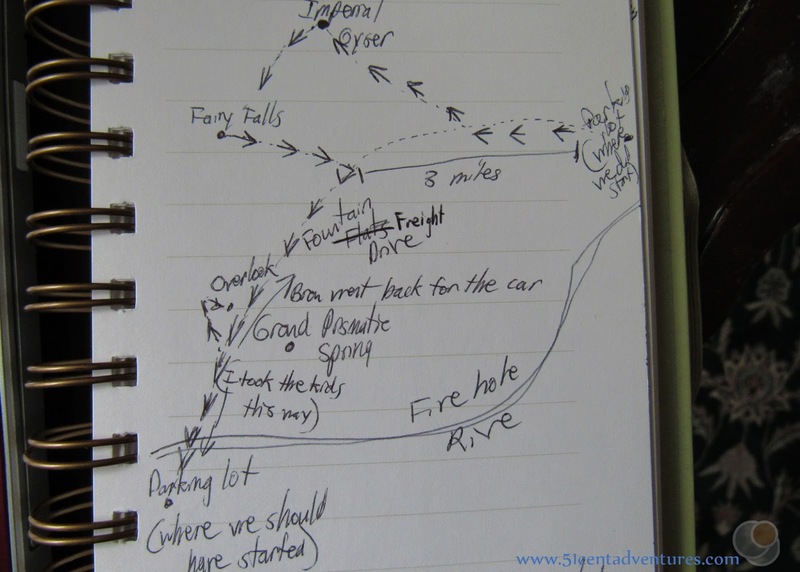 Since we can't use those maps in this post, you get to see the crude map I sketched out in my journal after the hike. This will give you a rough idea of what our day was like. The traditional way to reach Fairy Falls is to hike on the southern end of Fountain Freight Road for about a mile before meeting up with the Fairy Falls Trail. However, the southern section of Fountain Freight Road was closed during the early part of the summer in 2017. The National Park Service was expanding the parking area to accommodate all the extra cars that would start parking there once the Grand Prismatic Spring overlook was complete. 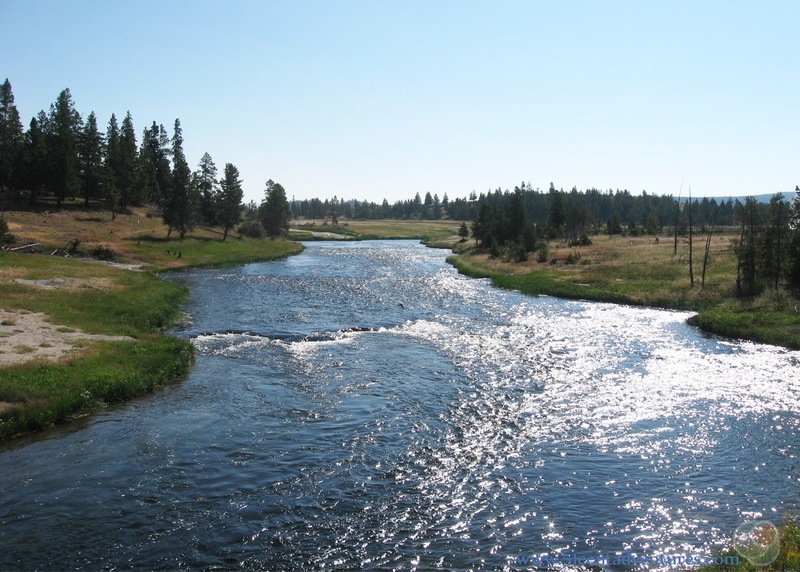 Every time we drove by the area I could see a trail closed sign on the bridge over the Firehole River. When I decided that it was time to visit Fairy Falls I just assumed that this part of Fountain Freight Road was still closed. I figured my family would just take the longer route to Fairy Falls via the other end of Fountain Freight Road. In retrospect, I should have realized that we hadn't been in that part of the park for about 3 weeks and that the southern section of Fountain Freight Road was probably open by this point. We should have taken a 10 minute drive down the Grand Loop Road to verify that the Fairy Falls trail was still closed before we went on our long hike. But we didn't think to do that. We didn't think about a lot of things actually. 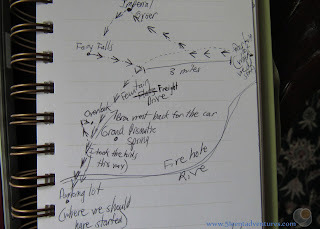 For example I had no concept of how long this route to Fairy Falls really was. On this day I had a whole list of things I wanted to see inside the park. I wanted to hike to Fairy Falls, then hike to Mystic Falls, then go to Old Faithful for a solar viewing demonstration, then hike to the observation point overlooking Old Faithful, and finally go swim in the Firehole River. I made these over-ambitions plans before I looked closely at a map. When I finally did get the map out I realized that the hike to Fairy Falls would be quite a bit farther than I anticipated. Even if we'd planned to use the regular Fairy Falls trail there was no way we could fit all that in. I decided we'd hike to Fairy Falls and then see what we felt like doing after that. We started our hike at the parking area at the end of Fountain Flats Drive. Fountain Flats Drive is a paved road that extends about a mile southwest of the Grand Loop Road. This area doesn't have any "must see" features, which makes it a nice place to get away from the crowds that you'll encounter along this section of the Grand Loop Road during peek times. We left our car in the parking area and started walking on Fountain Freight Road. This is an old road that is now closed to cars. Bicycles and pedestrians are welcome on this wide, flat trail. Fountain Freight Road extends 4 miles south to the Fairy Falls Parking Lot. 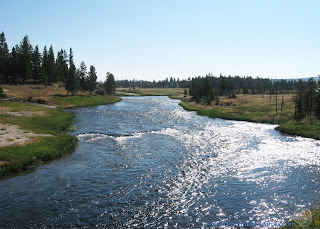 We crossed a bridge over the Firehole River. I can't remember exactly what time we started this hike, but it was probably 9:00 in the morning. The air was cool and we had tons of energy. Ole Calente is a hot spring on the other side of the river. It's pretty and actually not a bad little destination if you want to just park on the Fountain Flats drive and walk the 1/4 of a mile to see it. But we weren't interested in stopping at the spring. 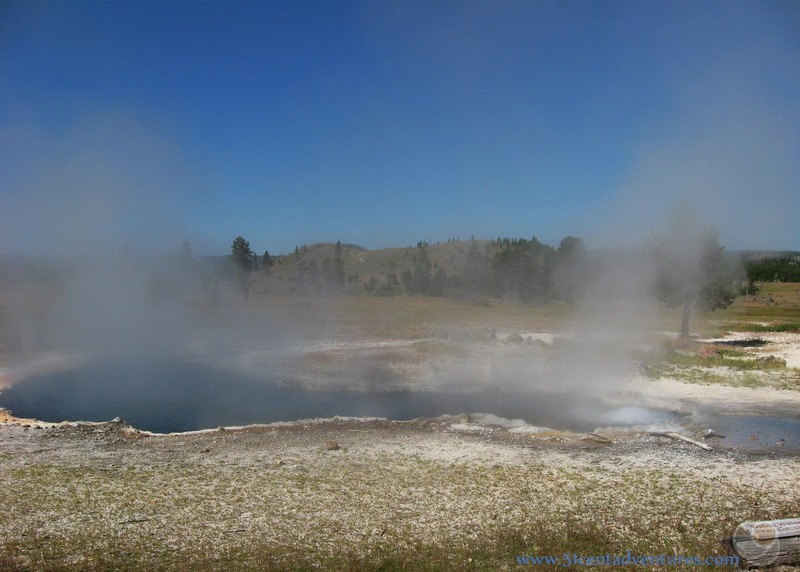 To our left we could see steam rising up from the geysers and hot springs of the Fountain Paint Pot area of the park. It was fun to see it from this angle. Even though I'd originally underestimated the length of this hike, I wasn't too worried about it now. 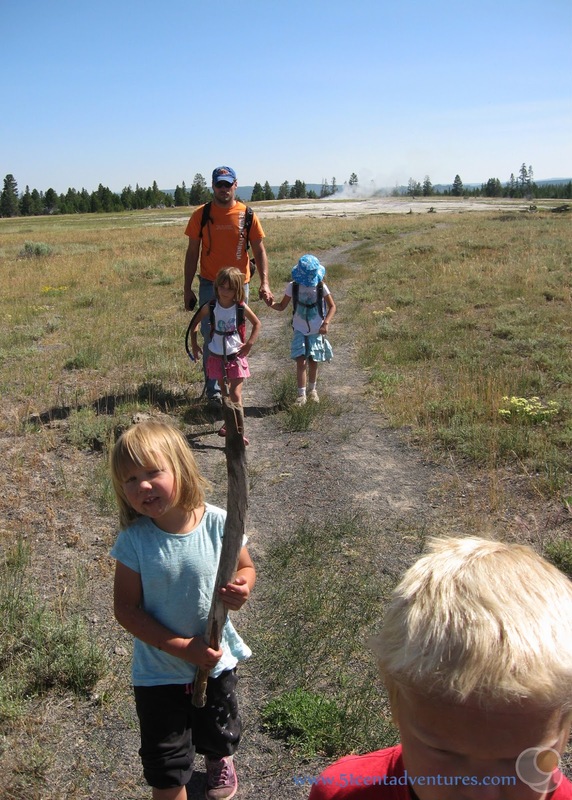 My family had hiked to the top of Mount Washburn a few weeks earlier. The kids had done great on that 7 mile hike. So I wan't worried about how they would do on this flat trail. We had plenty of water and snacks so we were ready for a long day of hiking. The kids hiked along happily and we were all in great moods. I knew that Fairy Falls was somewhere in that ridge in the distance, and I was okay with a long hike. 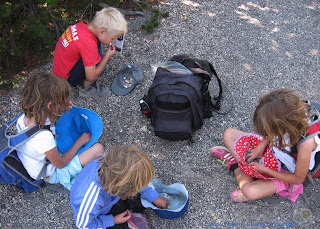 One way my husband and I keep the kids going on long hikes is to give them snacks every so often. By this point in the summer we'd learned that hats doubled as excellent snack bowls during breaks. After about a mile a trail extended west off of the Fountain Freight Road. 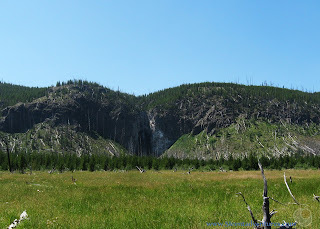 This was the Imperial Meadows Trail which was 2.5 miles and would take us to Imperial Geyser before circling around to Fairy Falls. I wasn't sure if the geyser would be worth the long side trip. But my husband convinced me that it wasn't adding that much distance. 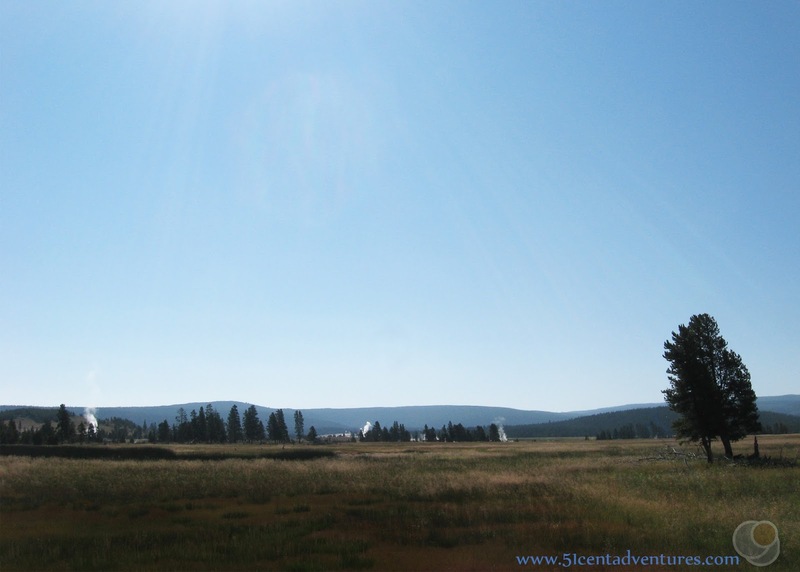 So we left Fountain Freight Road and turned right onto the Imperial Meadows Trail. We'd passed several groups of people on Fountain Freight Road, but after we got on this trail we saw maybe two other people until we reached the geyser. We passed several small geysers that weren't even named on our map. Aside from the trail it felt like we were the first people to ever visit this area. For the most part the kids were still doing well. Though there was the usual nonsense over carrying sticks. And a little bit of whining about the lack of shade. Around this point we started to be attacked by biting moths. I didn't even know moths could bite. But these things bit with a vengeance. They even bit through our clothes. Google tells me that these were Army Cutworm Moths, but don't quote me on that. The kids were crying, but we'd come so far that turning back wasn't an option. Thankfully we could finally sort of see Fairy Falls in the distance. Seeing our destination helped motivate us to keep on going. We came to a large meadow. The ground in the meadow was so soggy that we couldn't walk on a normal trail. The park service had laid out split logs for a trail. It was really cool to walk though the tall grass this way. Crossing this meadow on the logs became one of my favorite Yellowstone experiences. After 2.5 long, hot, and occasionally painful miles we met up with the extension of the Fairy Falls trail that led to Imperial Geyser. 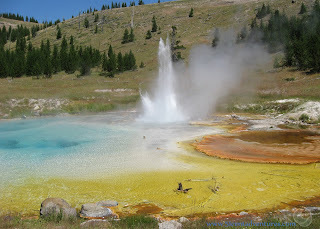 But when we reached a geyser I was very underwhelmed. We'd come all this way for that? My husband noticed a run off channel that seemed to be coming from farther up the trail. So he went up the trail to investigate. 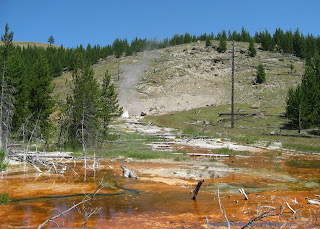 After about 10 minutes he came back grinning and said that the real Imperial Geyser was located 100 meters up the trail. He said that he'd watched it erupt for about 5 minutes. The eruption had stopped, but had started again after only a minute's rest. So we went up there and were greeted by the best kept secret in Yellowstone. 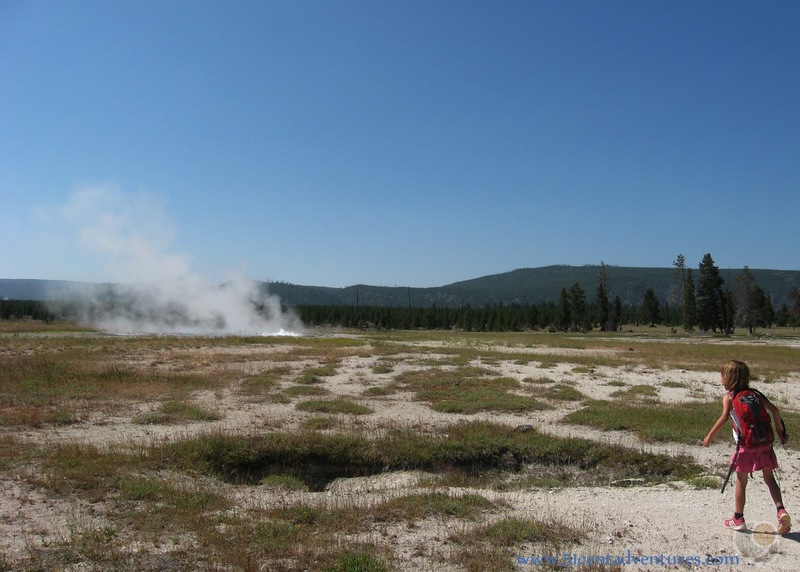 Imperial Geyser is a fountain geyser that erupts about 15 feet in the air for about 5 minutes at a time. There's only about a minute between eruptions. We ate our lunch while enjoying the stunning site. This was definitely worth the hike. Then it was time to continue on to Fairy Falls. We'd been able to see the ridge with the falls during the whole hike. At first we could just see a dark impression where the falls were. But gradually we could make out the thin waterfall. Finally we were close enough to hear the water falling. We went up close to the falls and found a shady area with a small pool. Some hikers were brave enough to get into the cold water. We were content to sit on the side and enjoy the cool air. It had been a long hike, but I felt it was worth it. I looked around at the people around the waterfall, and realized that there were many more people here than I'd seen on the Fountain Freight Road. And some of the groups of hikers included children younger than my own. There was no way all these people had hiked the 4.5 miles from the Fountain Flats Drive parking lot. I began to suspect that maybe the real Fairy Falls Trail parking area was open after all. And if it was open it meant that something else that had been closed might be open. 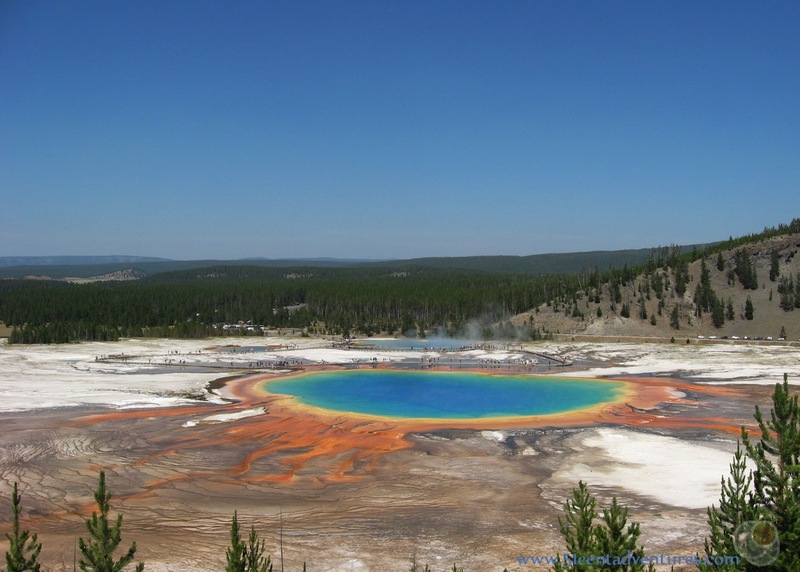 One reason the Fairy Falls trail had been closed earlier this summer was because the park service was building an observation area on the hill that overlooks the Grand Prismatic Spring. For years people had climbed the hill in order to get a good look at the largest spring in the park. None of the trails were official and quite a bit of erosion was occurring. Finally the park service decided to just put in an official trail and observation point. Hiking to the observation deck was on my list of things to do that summer so I wanted to see if it was open. So we followed the real Fairy Falls trail 1.6 miles to where it connects with Fountain Freight Road. This sounds easier than it really was. My kids were pretty much done with hiking. The only way, and I mean only way, I kept my 3 year old going was to play a game where we tried to spot the little red trail markers placed in the pine trees along the trail. Those little red markers kept all of us going. When we reached the Fountain Flats drive we didn't start the 3 mile hike back to the car. 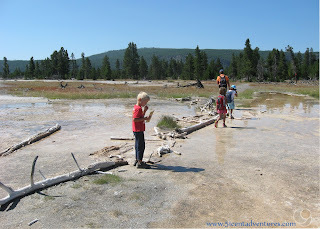 Instead we turned south toward the hill above Grand Prismatic Spring. We could see people on the observation platform, and soon we found the trail to the top. The view was definitely worth the short hike up there. I'm so glad we decided to do that. The kids and I ended up waiting for over an hour before my husband arrived. I have no idea how long it would have taken us to hike back to the car with four tired kids in tow. By this time it was after 5:00 and we were wiped out! All our other plans for this day would have to wait until other days. We drove back to the RV, had quick dinner of sandwiches, took showers, and then sat on the couch and watched DVD episodes of MacGyver for two hours until bed time. At the time I felt silly about our decision to hike to Fairy Falls from the Fountain Flats Drive parking lot. Had it really been the best use of our time in the park? But looking back on the experience I'm glad we did it. Some of our best memories are from this hike. Recommendation: I really DON'T recommend this hike. 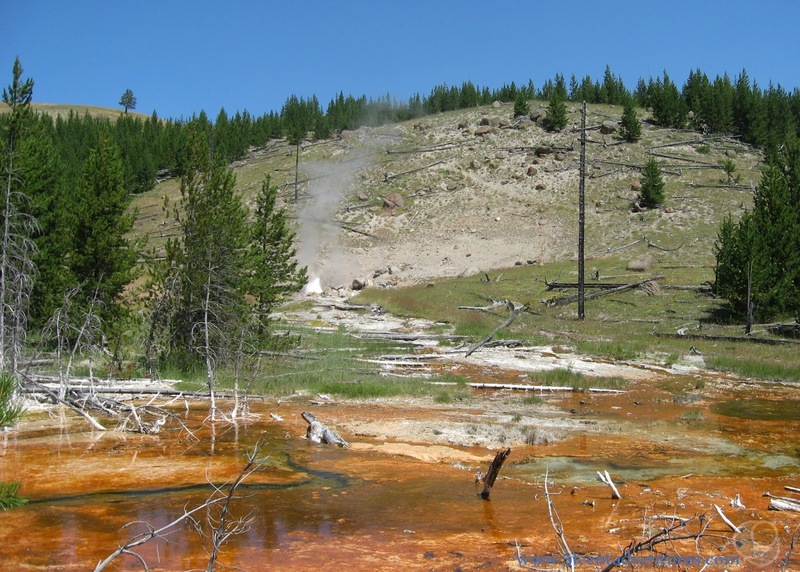 If you want to see Grand Prismatic Spring, Fairy Falls, or Imperial Geyser you can take the regular trail from the Fairy Falls parking area. 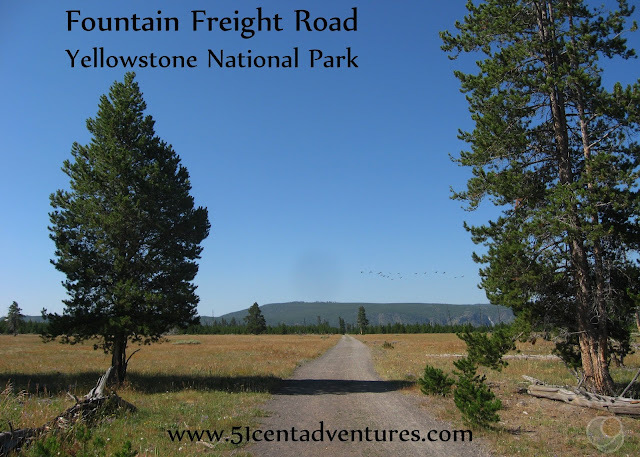 However, if you are looking for a way to really slow down and appreciate Yellowstone, then this hike might be for you. Directions: The trail starts at the parking lot on Fountain Flats Drive. 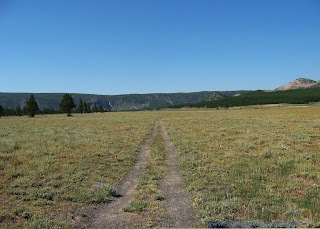 Fountain Flats Drive is roughly 5 miles south of the turn off for Firehole Canyon Road on the western side of the lower loop of the Grand Loop Road.